The purpose of this review is to discuss the various techniques of percutaneous tracheostomy and to assess their safety and efficacy profile, indications and contraindications, early and late complications. Literature was reviewed from Medline and MD Consult databases. Early techniques by Sheldon, toye and Schachner have been abandoned due to their high complication rates. Percutaneous dilational tracheostomy using the Ciaglia kit (Wiliam Cook Europe Bjaeverskov) and a Griggs kit (Portex PDT kit, POrtex, Hythe, Kent, UK) has been used most often. Griggs guide Wire Dilator Forceps kit (SIMS, Portex, Hythe, Kent, UK) is the next most common in use but its long-term studies are few. Fantoni (TLT set, Mallinckrodt Medical) and PercuTwist device (Riisch, Kernen, Germany) are two new techniques currently under study. Percutaneous dilational tracheostomy and conventional surgical tracheostomy are still competing methods to provide an airway for intensive care patient requiring assisted ventilation. Review of literature shows that percutaneous tracheostomy is safe, cost-effective and compares favourably with the open surgical tracheostomy. Many intensive care units now use the percutaneous tracheostomy as a procedure of choice. Percutaneous tracheostomy has a learning curve and requires appropriate case selection and meticulous attention to the technique by all those who want to use this method. Hundred adults undergoing open heart surgery were randomized into two equal groups. In group I (n=50), surface anatomical landmarks and in group II (n=50) atrial ECG was used as a guide for correct placement of the central venous catheter (within 1 cm of superior vena cava - right atrial junction). The position of the catheter tip was confirmed by direct palpation by the surgeon on the operating table and by radiological examination in the post operative period. Surgeon's assessment revealed that the catheter was successfully placed in 32 (69.6%) patients in group II and 25 (50%) patients in group I (p=NS). Radiological examination revealed that the catheter was successfully placed in 31 (67.4%) patients in group II and in 28 (57.1%) patients in group I (p=NS). Amongst the unsuccessful placements right atrial placement was present in 5 patients (10%) in group I and 7 patients (15.2%) in group II by surgeon's assessment and 8 patients (16.3%) in group I and 9 patients (9.6%) in group II by radiological examination (p=NS) No complications related to intracardiac placement occurred in any of the patients. We conclude that atrial ECG is a promising technique for central venous catheter placement, although it did not significantly increase the correct placement in this study. This may be due to alteration in the relationship of sino-atrial node and superior vena cava - right atrial junction in patients with cardiac disease. Further studies defining the correct technique of insertion, (especially in cardiac patients) are necessary to improve the success rate. Perioperative tachycardia is common in patients undergoing surgery. In patients with mitral valve stenosis, the tachycardia can precipitate congestive heart failure and pulmonary oedema. Efficacy of atenolol premedication (0.5 mg/kg) for haemodynamic stability was assessed in 37 patients undergoing closed mitral commissurotomy (Group I) and compared with 43 patients who did not receive it (Group II). Patients with mild aortic regurgitation, atrial fibrillation, mild to moderate pulmonary artery hypertension or severe pulmonary artery hypertension without right ventricular failure were all included in the study. All patients were premedicated with tablet diazepam 0.1 mg/Kg, on the previous night and on the day of surgery and intramuscular morphine 0.1 mg/kg and glycopyrrolate 0.2 mg 45 min before surgery. In addition, in group I, atenolol 0.5 mg / kg was administered at night and 2 hours prior to surgery. Anaesthesia was induced with thiopental, morphine, oxygen and isoflurane. Tracheal intubation was facilitated by pancuronium bromide 0.12 mg/kg. Maintenance was with morphine, isoflurane and nitrous oxide in oxygen. The study was confined to the periods of maximal anaesthetic and surgical haemodynamic stress like laryngoscopy, intubation, surgical incision and commissurotomy. For all periods of haemodynamic stress, heart rate was significantly lower in group I, (p<0.05) than Group II. Blood pressure variations were comparable in both the groups. A statistically significant (p<0.001) decrease in systolic, diastolic, and mean arterial pressures, were observed in patients of both groups before and during valvotomy. One patient in atenolol group experienced bradycardia of <45 beats per minute. This was not associated with hypotension and it was easily treated with atropine. 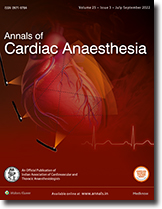 This study documents that, selective ss - blockade with atenolol in patients undergoing closed mitral commissurotomy, ensure a predictable control of heart rate in the perioperative period. Haemodilution resulting from crystalloid priming of the cardiopulmonary bypass (CPB) circuit is one of the important reasons for blood transfusion in cardiac surgery, especially in patients with low body surface area (BSA). A prospective study was performed to investigate the technique of intraoperative blood donation (IAD) and retrograde autogous priming (RAP) to limit haemodilution and transfusion requirements. Forty patients with low BSA (<1.7m2) undergoing primary valvular cardiac surgery were assigned to either RAP group or a control group (C). The RAP group (n=20) was subjected to IAD by collecting a calculated volume of blood (272+/-44.3 mL) after induction of anaesthesia. Prior to initiation of CPB the prime volume was reduced by discarding some of it and the CPB reservoir was filled retrogradely through the aortic cannula draining 482+/-78.4 mL of blood. In group C (n=20) only IAD was carried out collecting 295.0+/-62.6 mL of blood. Anaesthetic technique was similar in both groups. Strict transfusion thresholds were observed. There were no significant difference between the groups with respect to baseline characteristics, BSA, type of procedure, perfusion technique and haematologic profile. The haematocrit on CPB was significantly higher in the RAP group as compared with group C (24.2+/-1.3% and 22.1+/-2.5% respectively, p=0.009). Transfusion of allogenic blood during and after surgery was significantly lower in the RAP group (143.6+/-117mL) versus 405.2+/-358.1mL in group C (p=0.02). Postoperative chest tube drainage was 218+/-67.4 mL in the RAP group and 300+/-191 mL in group C which was not significantly different (p=0.18). The technique of intraoperative autologous donation and retrograde priming is simple, safe and cost effective procedure for blood conservation in patients with small BSA undergoing primary valvular surgery.